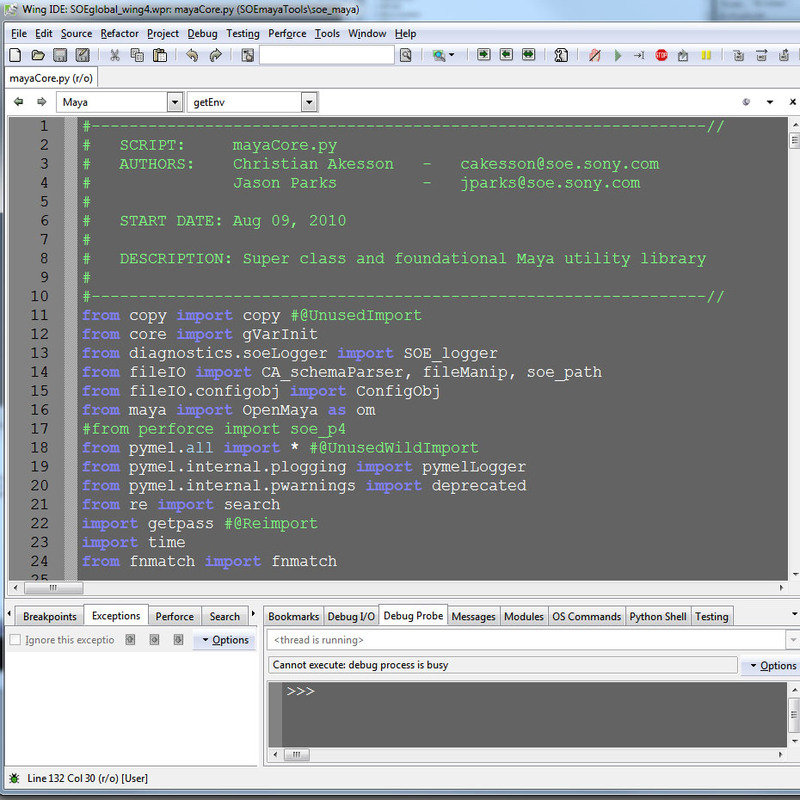 There are some great posts and pages explaining how to setup Wing IDE to remotely debug a Maya session. Eric Pavey first posted how to do this at his WarpCat Blog along with how to send commands back and forth to Maya from Wing. Luckily, now, many of us are starting to use this workflow and some other little tips and tricks have been discovered. I’d like to spell out all the steps from beginning to end right here. C:/Program Files (x86)/Wing IDE 4.0/. and put it into your favorite pythonpath folder with the rest of your development code. WINGHOME = r"C:\Program Files (x86)\Wing IDE 4.0"
Go ahead and remove the keyword arg ‘autoquit=False’ from the StartDebug call. Should still work. You working in OSX by any chance? Trying to determine when this arg is needed and when it errors. I got that error at home on OSX when I had that keyword in the call as well. Nope, on win 7 -64 bit. I did remove the arg already and it works fine. I went over all of Wing’s debugger docs today to familiarize myself so I still need to test debugging one of my scripts but I believe I’m off to a very good start! Holy crap! I put this off for way too long. This and unittesting have just changed/saved my pipeline. Thanks for posting this! Goodbye Eclipse/Pydev! I use both Wing and Eclipse/Pydev is a superior coding environment. Wing is better at debugging w/ the debug probe and has nice unitTest features. It seems a bit much, but using both is a very nice solution, actually. I tested today the debugging with Wing IDE and works fine! But, I see in your presentation one video where you write “joint(n=’test’)” and the joint is created in Maya instantly. I try to recreate the same example but the joint only is showed in Maya when the debug is finished. The Maya viewport doesn’t refresh when Wing IDE is in debug mode. How can I fix that? The refresh of the app while debugging is pretty finicky. It is not supposed to refresh at all. I think under certain conditions you can get the perspective view to redraw but I could never get the outliner to redraw. I do not remember exactly how I stumbled across how to do this, it was really more of a ‘bug’ rather than a feature. It may have been a Win7, thing. But it still does not help. Any Idea what I’m doing wrong ? Maya should not terminate on an error of course. I’m pretty sure you have to have ‘Kill Externally Launched’ to get any kind of connection. I’ve never run the debugger without that checked. But that is not the answer. Most people cannot connect, but I’ve never heard of your problem before. Many people have got this to work, so there must be something odd in your setup. I would suggest starting from scratch. You can always email them. I’ve found they’ve been very responsive and fixed anything I needed. If you find out what was wrong, please post here to let us know. You’ll have to be more specific than that. There might be minor changes as all the softwares have updated since then. You may want to consider upgrading to PyCharm as it is a far superior product, however.